PlayStation gamers might get to play Bungie’s Destiny a little earlier compared if a recent ad is to be believed. 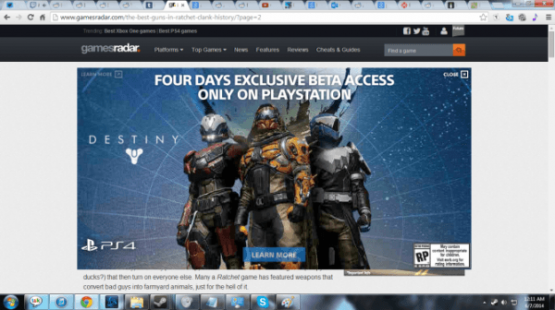 Reddit user Probably_Unemployed was able to capture a screenshot of a website ad running on GamesRadar (now pulled) where it mentions, “Four Days Exclusive Beta Access Only on PlayStation.” Clicking the ad itself will lead the user to Sony’s “Greatness Awaits” website, with no other info pertaining to the beta. The ad doesn’t say, but from the wording, it seems this early beta access applies to both the PlayStation 4 and PS3 version of the shooter. Just last month, Activision announced that the Destiny beta will commence this July. With E3 right around the corner, there’s a very high possibility that the exclusive four-day access will be part of Sony’s press conference, which would make sense given that Destiny has been promoted heavily on the PlayStation 4. We’ve reached out to Activision for a comment and will update the story once they’ve responded.